Need a way to get noticed and get your message out to a large group, all in a cost-effective way? A custom banner is a great option! Get Branded 360 can help you design and create a banner that’s right for any application—whether you need a temporary advertisement or a semi-permanent message. With vivid imagery, strong text and precision layout, we promise your banner will be a great representation of your brand. 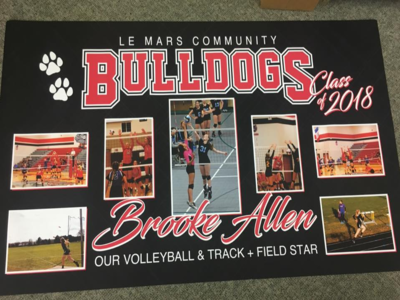 Using high-quality vinyl materials, we create custom banners in Plymouth County, IA and the surrounding areas that are great for both indoor and outdoor use. Whether you’re attending a trade show or displaying your message at the local baseball diamond, our banners will stand up to the test of time and weathering to look great for years to come. And, with simple hanging designs such as built-in grommets, you’ll be able to quickly deploy your messaging. There’s a lot that goes into making banners and custom signs in Plymouth County, IA for our widespread clients. More than just slapping a logo and some text on a banner, we take a complete design approach. This includes picking the right imagery, text, logo and colors, paying mind to layout and making sure the entire thing is scaled appropriately. Our attention to detail results in a banner with clear messaging and a hard-to-miss value proposition. Whether you’re marketing a sale or event, or just relaying important information about your brand, banners and signage are the best way to go about it. Get Branded 360 is ready to help make sure you’ve got the large-format advertising materials you need to make a statement. Consult with our in-house design team today about banner design and layout, as well as materials and sizes. We’ll learn more about your message and application, to provide insight that results in a high-caliber banner for your brand—one that makes sure your message can’t be missed. Stop in or contact us today at 712-546-4911 to start planning.